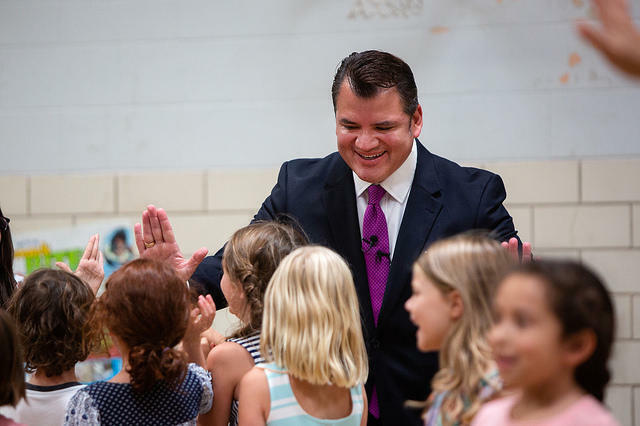 Austin Independent School District Superintendent Paul Cruz greets students on the first day of school at Barton Hills Elementary School on Tuesday. Central Texas students are back in class for the 2018-19 school year. It can be a busy time, searching for just the right notebook and adjusting to earlier alarm clocks and busier afternoons and evenings. But adult caregivers and children are encouraged not to ignore feelings that can crop up during the back-to-school season. Certified life and relationship coaches Junice and Rock Rockman say parents, adults, caregivers, teachers and others should give children the time and space to experience the emotions that come up when returning to the school routine ­– even when it's not smooth sailing. "Oftentimes, as parents, we try to protect our children from all of their problems," Rock Rockman says, "and it's impossible for us to do that, number one. Number two, they need to learn how to deal with their problems." Both Rockmans agree it's important not to predict or assume which feelings children will experience as the school year gets underway, and adults should not transfer their own feelings or remembrances of going back to school onto their children. The Rockmans' daughter, Grace, just started fourth grade. For her, the new school year elicits a variety of responses. "I feel anxious, nervous and excited," she says, "because I had a lot of friends from first to second to third, so I am excited to see them and also I am very nervous about the hard work." Junice Rockman says one way to help manage what can be a turbulent time is to set realistic expectations, especially for busy mornings. She encourages togetherness over tasks. "Who cares if there are some dishes in the sink when you walk out the door?" she says. "You all got to sit around the table ... and share experientially. And sometimes there is nurturing and comfort just in being in the same space where you're not having a huge to-do list; you're just being."